I wish i had some of these now ~ just broke a nail swapping keys around on traditional key rings this weekend! 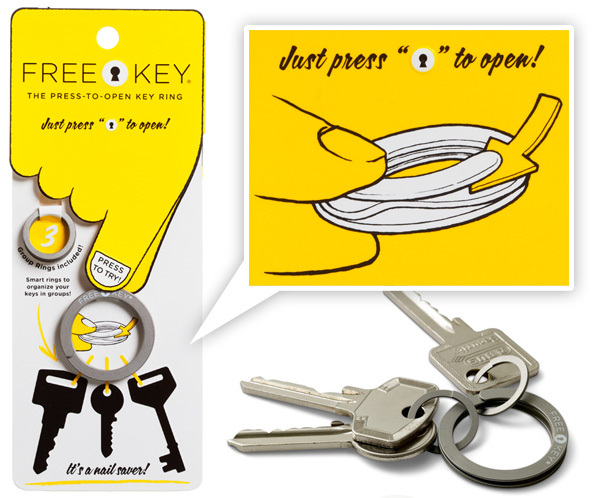 These Free Key “Press-To-Open” flat keyrings by Eric von Schoultz made of sand blasted stainless steel are nail savers ~ just press/pinch and the leverage helps open the end! Nice and easy to slip the keys on and off when needed. Cute packaging as well ~ see lots of pics on the next page! Happy Friday! 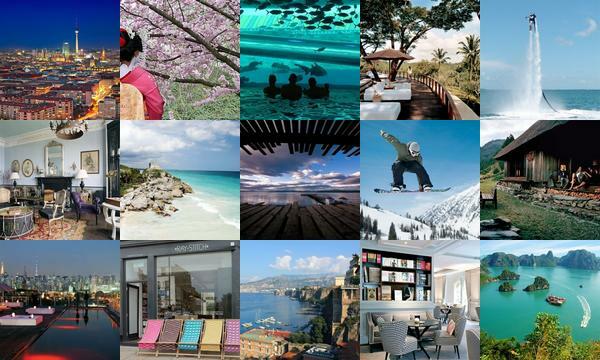 Find your getaway inspiration from this week’s roundup from NotVentures, which includes adventures in the South of France, Caribbean beaches and tips for a grizzly encounter! 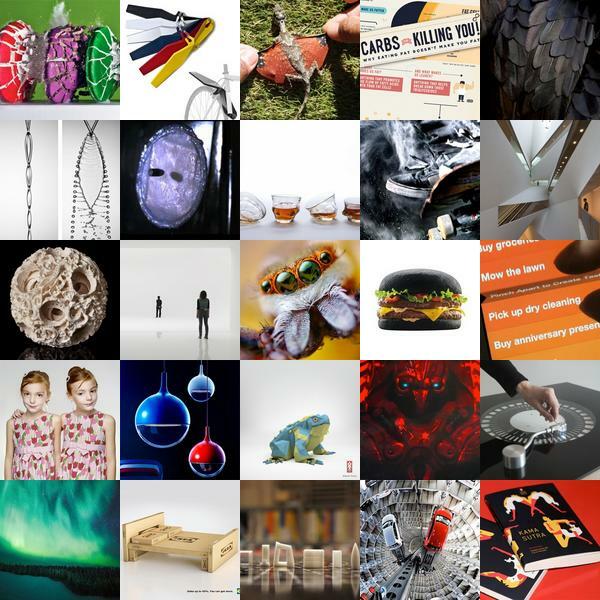 Find out more about each post by clicking on its individual image. This season Areaware is launching this series of adorable new beech wood animals by Karl Zahn (who was also behind Areaware’s animal boxes. The new selections include a set of dovetail animals as well as stackable crocodiles! Each of the dovetail animals is composed of three segments, so you can mix and match parts from the five styles: dog, llama, elephant, horse and crocodile. 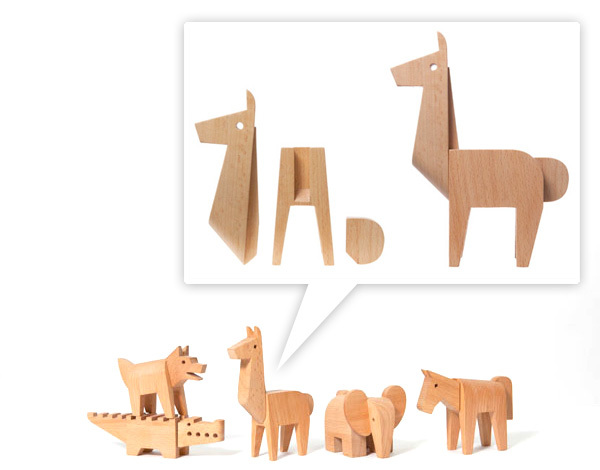 More photos and a video of the new wooden animals on the next page. Green tea cream puffs, delectable pho bo and ‘The Duck Fat Sazera’ are all part of this week’s roundup from Tasteologie and Liqurious. 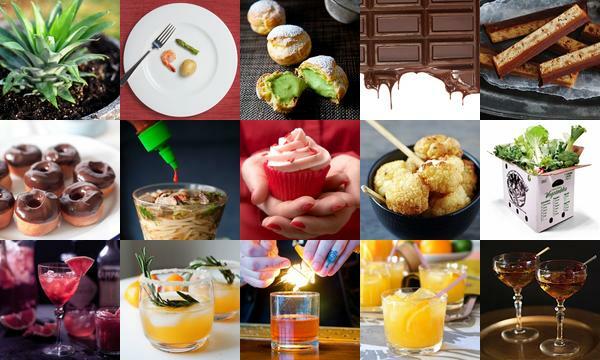 Find out more about each delectable post by clicking on its individual image. This post is coming to you from MiO. 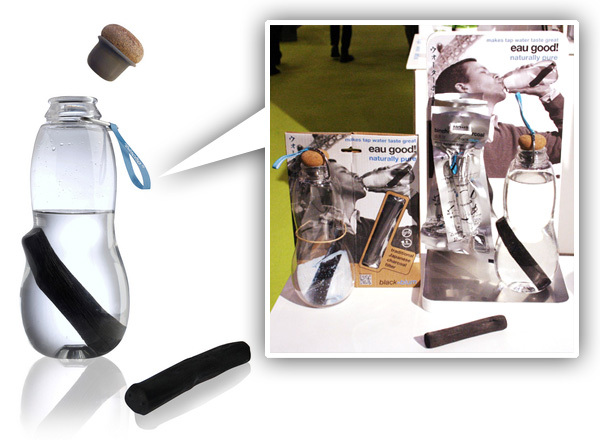 Change your water. Change your day. What do you want to change? 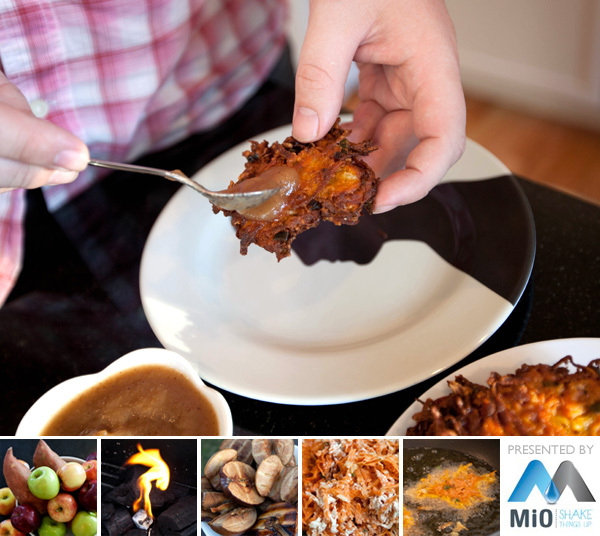 Our Tasteologie editor, Jackson, took on the challenge of shaking the usual up to mix and match unexpected tastes for a surprisingly delicious experiment this weekend! Here are his results! My favorite thing about food, apart from its uncanny ability to keep me alive, is its flexibility. Flavors, textures, ingredients, regions… can all swivel about and inject new life or old comfort into just about anything. Growing up, some of my favorite meals came from visiting relatives down in North Carolina. The flavors of soul food and bbq just make me smile. Other friends have some of the same warm fuzzy feelings of family and home associated with Jewish food during the holidays. Combining the two together seemed like something we had to do. Bulletproof skin, solar flares and the vision of jumping spiders are all part of this week’s roundup from NOTCOT.org. To find out more about each post, click on its individual image. It started with a random idea of making use of the plastic milk crates in NOTlabs for shelving… to wondering about wooden ones… to searching craigslist… to THIS… which lead to a random little roadtrip out to Ontario… to meet with John Mihovetz, quite the collector of found objects, architectural salvage, and repurposed home furnishings… and see the remainder of the 4,000 vintage wooden soda crates he bought in the midwest 6 months ago and has been selling off since. It seems like it was quite the find/investment! 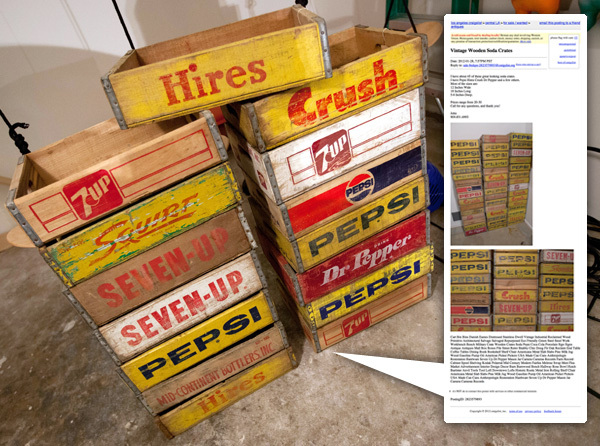 Anyhow ~ now we have 15 amazing vintage wooden soda crates ~ Pepsi, Squirt, Crush, Dr. Pepper, 7up and more ~ and after some clean up, perhaps some awesome shelving in NOTlabs… but for now, take a peek at some of the details on the next page! A Linne’s two-toed sloth (Choloepus didactylus) at the Lincoln Children’s Zoo. 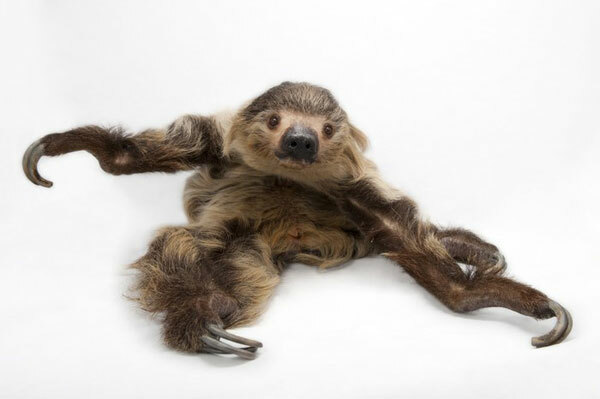 National Geographic photographer Joel Sartore is on a mission to capture our incredible biodiversity before it disappears. Using zoo animals to create stunning portraits of amazing creatures. The project began with amphibians (and the gallery includes some real gems), but now includes all sorts of creatures, totaling over 1,800 already. Find out more about the ambitious and stunningly beautiful The Biodiversity Project and see a selection of photos from the project on the next page. These made my day. 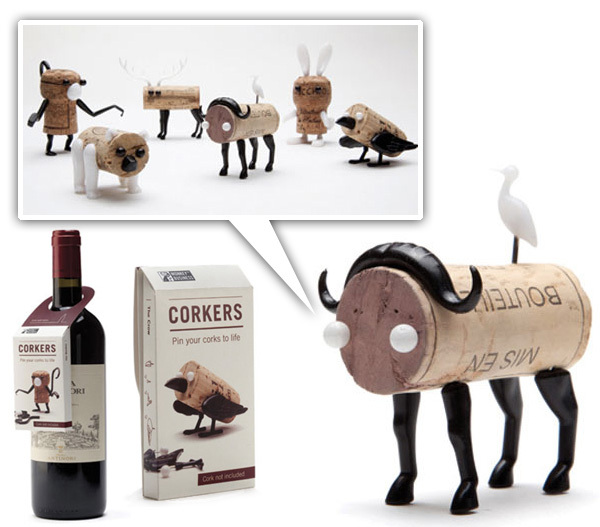 Corkers are a design collaboration between Oded Friedland and Reddish Studio for Monkey Business are push pins that you can prick into wine/champagne corks to turn them into little creatures! The options are ‬Monkey‭, ‬Deer‭, ‬Buffalo‭, ‬Bear‭, ‬Bunny‭ ‬&‭ ‬Crow. The packaging turns it into a fun wine bottle hang tag/gift ~ perfect for the next bottle of wine… Take a peek at more details up close on the next page. I love grilled cheese. It is the combination of two of humankind’s oldest food products. As it is about ten thousand years old… we’ve had lots of practice in eating and making this comfort food staple. 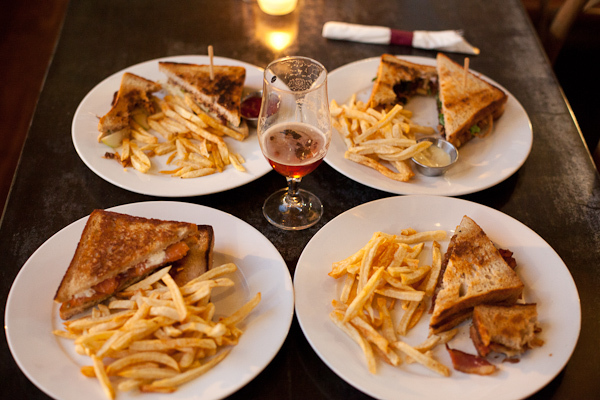 Little Bear, a new bar in downtown L.A., offers a quartet of interesting grilled cheeses to go along with its amazingly well curated selection of Belgian Beer. It is a fantastic addition to Los Angeles’s Arts District and fits into the growing local network of lofts, artists, artisans, film shoots, factories, and restaurants. Little Bear brings nuance and great attention to detail raising otherwise straight forward food and beer into a warm comforting embrace. I couldn’t resist sampling their entire grilled cheese lineup! See more pics on the next page! 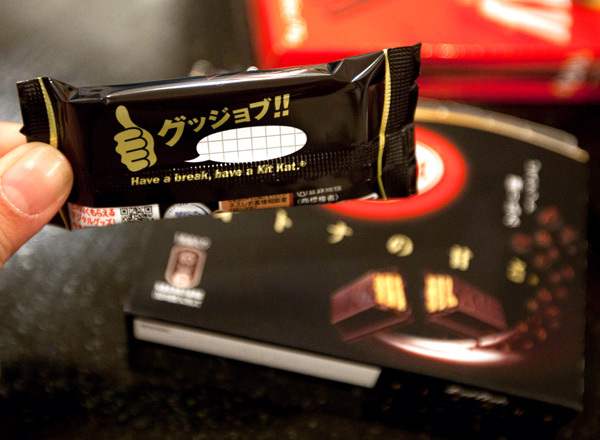 What is it about Japanese Kit Kats that are just THAT much more delicious ~ and beautifully packaged ~ and the dark chocolatiness is amazing too… Gave in to this at the Mitsuwa last night and it was too delicious and cute not to share. It looks like you can even add your own messages on the pack of the individually wrapped pairs that are nestled within the matte/gloss mixed outer box. One if particularly twitter looking… take a peek on the next page! 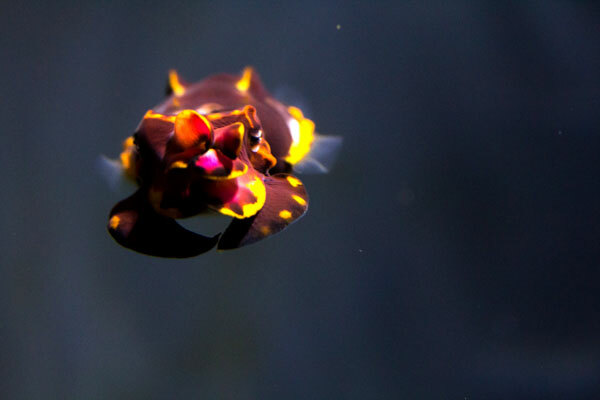 A zoo and aquarium regular, I love discovering new creatures and one of my favorite aquarium specimens in the Steinhart Aquarium at the California Academy of Sciences was the Flamboyant Cuttlefish (Metasepia pfefferi), a colorful species native to the tropical Indo-Pacific. True to their common name, these cuttlefish are incredibly beautiful and mesmerizing to see in action. See more photos and videos on the next page! Shark-filled water slides, cherry blossoms and craft cafes are all a part of this week’s roundup from NotVentures. To find out more about each post, click on its individual image. Super cute concept ~ Busy Beaver Buttons (maker of NOTCOT buttons!) 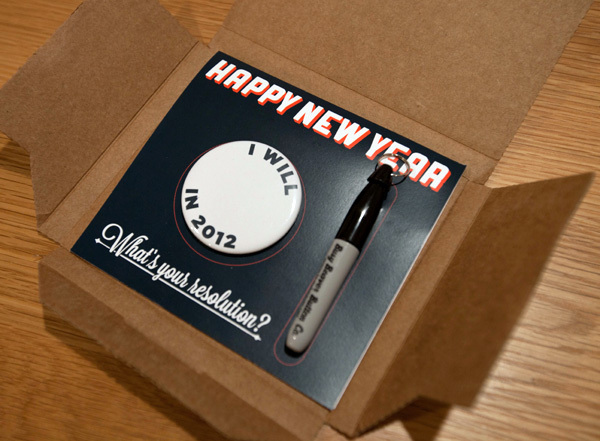 sent over their playful new year’s card ~ love that they give you a fill-in-the-blank button and mini sharpie! Take a peek at the details and fun beaver graphic inside the card on the next page… as well as my resolution for 2012!